Here is my layout. This is Hannah after eating frozen blueberries. For some reason my kids love frozen blueberries (not me). I have a fun "Use It Up" layout on the American Crafts blog. This week is about using up those scraps. I managed to mix 4 different lines on this layout using my small pieces I cut into triangles. Come check out the tutorial HERE. Here is the layout using Ready, Set, Go, 5th & Frolic, Kringle & Co., & Pumpkin Patch. Thanks so much for stopping by!! I hope you have been inspired to use up your scraps! PS I used a sketch from Scrapfriends! Sorry I have been a little "missing" lately. I have a seriously bad cold and with being pregnant has made for one one miserable week :( I told me hubby I'd rather spend a day in labor then deal with not being able to breath for a week. Anyway, here is a layout I created with the sold out January kit from Citrus Twist. Come take a peek at what the February Kits will look like! I really "heart" working with all the fun colors and embellishments. If you like hearts you won't want to miss this kit. I had my first layout using Ormolu goodies up on their blog this week!! I had fun using the new lines Word Up & Bungalow. This layout is about my "One Little Word" that I picked for 2013. Since I have a little on the way I decided I need to "enjoy" life a little more. To see my full layout please go to the Ormolu Blog. Here is a sneak with the new "One Little Word" flairs you can get custom made from Ormolu. Check them out HERE! Thanks for stopping by and I would love to here what your One Little Word is for 2013! Played Out is a layout about my daughter Christmas Morning. Once the presents were opened and the excitment wore off she fell asleep with all her new things surrounding her. I tucked my journaling inside the cute bag that comes in the kit. Love the AC Glitter Thickers and the rich blue ink spot! I was very excited when Lori (from Gossamer Blue) ask us to create a Project 12 page! Davinie came up with the idea of Project 12 where you do a page like Project Life but only you do one page each month instead of one page a week. I have always wanted to do PL but knew I would never stick with it so this new concept is perfect for me!! You can read all about Project 12 and Gossamer Blue's challenge HERE! There is a fun challenge and some prizes for playing along. Here is my Dec. 2012 Project 12 page. 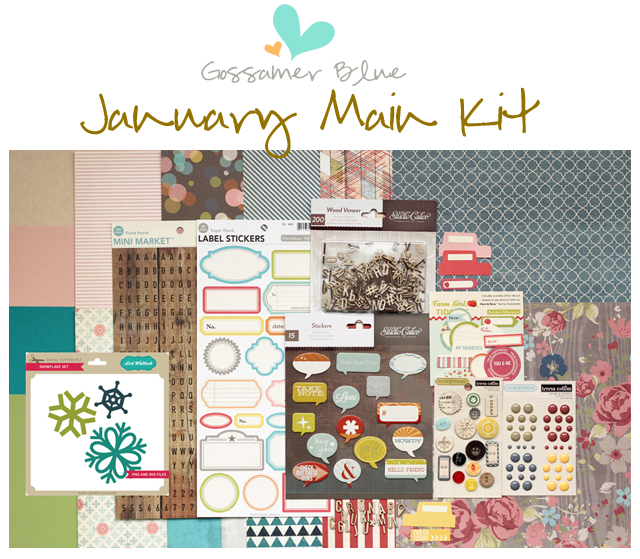 I used the Gossamer Blue Bits & Pieces kit for January and the new Color Kit. Thanks so much for stopping by! I hope you'll join me for a fun new challenge to document this new year! Well, I have been keeping a fun little secret from you all....we are expecting our 5th!! I know crazy right?! Well, this one was not exactly expected and kinda a miracle (I won't go in to details) but let just say we are being blessed again and I excited! I know God has big plans for this one just not sure what. This layout was created with the January Gossamer Blue Main Kit and digital only. I love those little snowflakes that are on the digital end of the kit. I cut them out on my Cameo. My time at Elle's Studio has sadly come to an end :( This was one of my favorite teams to be designing for! I loved every minute of it! If you ever get a chance to apply you must! I love the new stamp Elle's Studio has for Christmas. Can you believe it's 2013?? I can't believe how fast this year went! Today is reveal day over at Gossamer Blue! This kit rocked with it's amazing colors and all the fun little extras it held! It had some new My Mind's Eye in it and they did a feature post which include my layout! My Layout with lots of MME! Happy New Year and thanks for stopping by! !